According to Adland, Cadbury have revealed that the Eyebrows ad released on the 23rd January has now received 4 million online views. The YouTube Eyebrows upload has been embedded all over the blogosphere with even Perez Hilton blogging on it and Stephen Fry mentioning it on Twitter. However, the most interesting thing (as always) is to look at public interpretation on YouTube. Various people have re-enacted the Cadbury Eyebrows ad, whilst others have remixed it (and the beauty of the Eyebrows creative is that it is so simple for YouTube users to either act out or re-edit.) 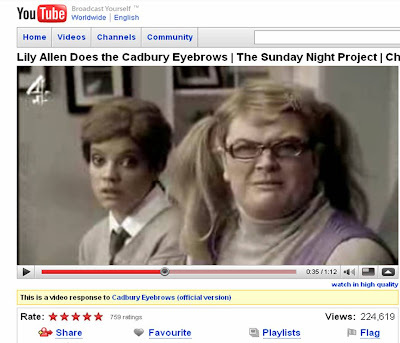 The Eyebrows ad was even featured on (UK TV channel) Channel 4 as Lily Allen and Alan Carr performed their own take on the Cadbury ad here. All showing that when creative strikes a cord and is easy to remix, then things will go viral by themselves - I wonder what the final view count will be, especially if the view counts from UGC interpretations are included?